Free use courtesy of Jim Herman - Many thanks! Elinor Jenkins Vaughan could be here! We know that her daughter died and was buried in Jacks Valley - also in an unmarked grave. It is very likely that Elinor was too. The earliest grave identified in this beautiful cemetery is from 1860. There is plenty of space and apparent depressions for lost grave sites. There are three possible locations for our lost graves in Jacks Valley: among the unmarked graves in the Genoa Cemetery at the bottom of Jacks Valley (on Jacks Valley Road - formerly the Pony Express and transcontinental telegraph route. 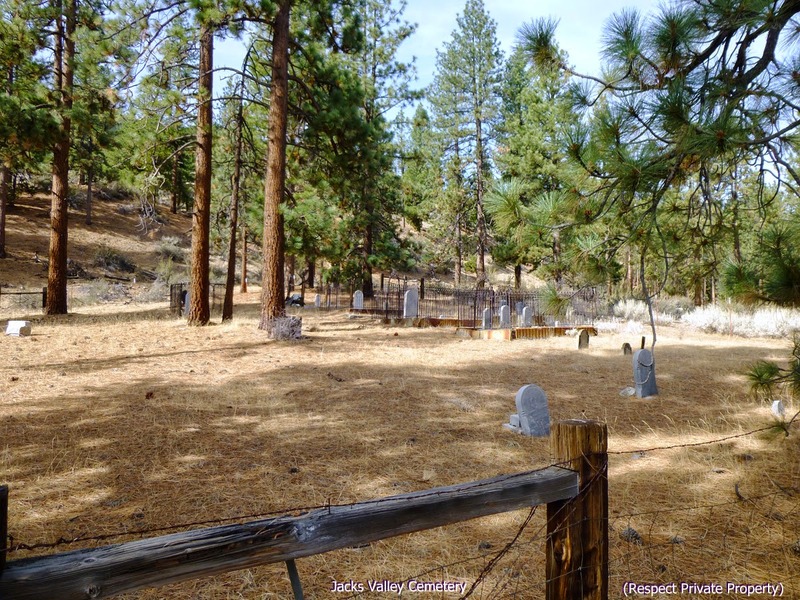 ); they could be here in the Jacks Valley-Winters Family Cemetery; or, they could be in an unknown location most likely on the Johns Family's former lands. And trying to track down my people, I ran across the most surprising things. 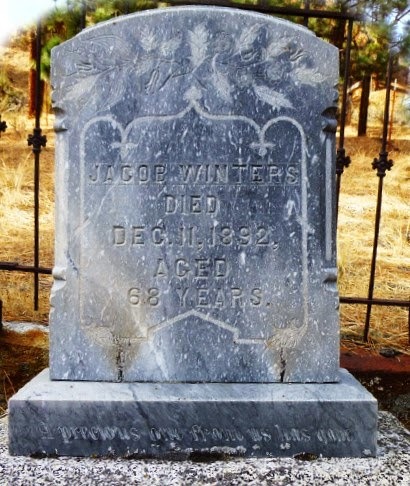 The "patriarch" of the Winters Family was Jacob Nathaniel Winters (1824-1892). Thinking he might be another lapsed Mormon, I checked him out on Ancestry and Family Tree. He was a bit more than that. Jacob was in the Rescue Party of the handcart Saints stuck in the Wyoming snow of 1856. That alone might be enough. . . . And then I saw that he served in the Mormon Battalion all the way to Los Angeles in 1846-47. He then would have gone over the Sierra, perhaps seeing the Carson Valley on the other side, to meet his people arriving in the Salt Lake Valley. He married Sarah Jane Cherry in Salt Lake City in 1852. There are credible reports that Jacob arrived in Jacks Valley as early as 1857. He may have arrived as the other Saints left, called back by Brigham Young for the Mormon War. We have yet no reason why Jacob Winters left for Western Nevada. If he left before the news of approaching federal troops reached Brigham Young at the 24th of July celebration, it may have been somewhat of a normal thing. Yet there were the issues of the Reformation in which some got a little over zealous. Still, some Mormons and Gentiles were leaving unhindered that year. Maybe the Winters Family and possibly the Lewises or Johnses were among them. They did end up with rather sweet land in Jacks Valley that may have been claimed and sold inexpensively by the departing Mormons. Jacob's step-mother, also buried in the family plot, became a faithful member of the Reorganized LDS. No record yet to see if Jacob did so as well. Jacob's LDS ordinances are done. Well, he did them while living if he wasn't cut-off for some reason. And as I found a few separate listings in Family Search, I suppose they have been done vicariously by others. They were old Ancestral File names so I didn't dig much deeper. And I resisted the temptation to add in his Mormon Battalion and Handcart Rescue services there or on Ancestry as I'm not family. Yet he should be remembered for them. The Lord won't forget. Neither should we. Thanks again to Jim Herman for the photo. I remember my great grandfather, John Jacob Winter as a child and recall that his father "hand forged" most of the iron work enclosing the cemetery.